“One building, two communities” isn’t just a catchy phrase. This is a reality for International Jewish Center (IJC) and Beth Hillel congregations in Brussels. Since last January, both progressive communities have effectively begun co-habiting in the spacious and beautiful building of Beth Hillel. This modern shul is a sophisticated religious, cultural and social center where the content of Progressive Judaism is strong, deep, inspirational and timeless. So, it was a perfect momentum for them to spread the word and to host over 60 lay leaders and rabbis during a shabbaton. These included, just to name a few, Carole Sterling (Chair WUPJ), Sonja Guentner (Chair EUPJ), Gordon Smith (President EUPJ), Leslie Bergman (Honorary Life President EUPJ), Rabbi René Pfertzel (Chairman European Rabbinic Assembly), Rabbi Edward van Voolen (Rabbinic Director Abraham Geiger Kolleg) and delegates from 14 European countries. This shabbaton in Brussels of the 9th, 10th and 11th November was an important culmination of celebrations and consisted of a full program of activities, including guided tours and workshops. The services were led by Rabbi Marc Neiger and rabbinical intern Dr. Brian Doyle. This week end marked 80 Years “Kristallnacht” 9/10 November 1938. During his drasha on shacharit shabbat, Rabbi René Pfertzel remembered that thirty thousand Jews were arrested in Germany in the immediate aftermath of this night, an event which marked the beginning of the road to the Shoah. 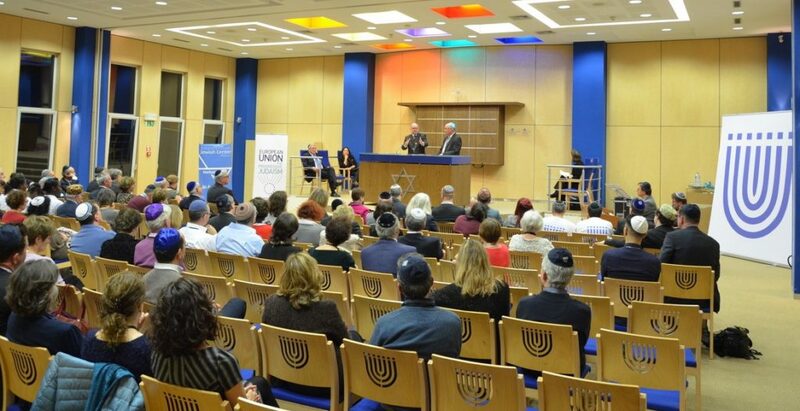 After the havdallah, it was time to celebrate the official opening of the EUPJ’s new European Union office. The office’s purpose is to give Progressive Judaism a presence and a voice vis-à-vis the EU Institutions. Bill Echikson, member at IJC and alumnus of the Wall Street Journal and Google, is now its director: “This European Commission has done more to protect and promote Judaism than any of its predecessors. It has named the first-ever European coordinator against anti-Semitism. It has pressed internet companies to combat online anti-Semitism. It has rebuked countries for trying to rehabilitate Holocaust war criminals and minimize their own guilt. And it has unlocked millions of euros in grants to fight anti-Semitism and finance interfaith initiatives”. The keynote speaker was Paul Nemitz, European Commission Senior Advisor and chief architect of its new GDPR privacy rules. Paul Nemitz’s grandfather Julius Moses was the last Jewish member of the Reichstag before World War II. During his talk about “Europe and the future of the Jews”, Paul Nemitz insisted that “democracy needs to be politically and socially engaged.” David Baltuch on piano and Jean-Marc Finn on flute framed the various speeches most beautifully with Ravel (Kaddish, Deux mélodies hébraïques) and the traditional Eli, Eli. The Brussels office will add a Progressive Jewish voice to a range of topics, such as the refugee situation and sustainability considerations. On Sunday, there were different workshops focusing on new trends in our communities, the future for the Reform Judaism in Europe, the challenges of our century due to nuclear weapons and global warming, state recognition of Progressive Jewish communities, the purpose of being a Progressive Jew, and Interfaith dialogue & antisemitism. We also marked the centenary of the end of World War I. Belgium was one of the key battlegrounds of that war. The “Great War” was supposed to be the “War to End All Wars”. Alas, that was not to be. Instead, it planted the seeds for World War II. The commemoration consisted of prayers and a 2-minute silence. After lunch, there was an opportunity to meet, engage with and hear from the EUPJ Board at their European Assembly and Open Executive Board meetings. At these meetings, Sonja Guentner also expressed the EUPJ’s warmest thanks for the wonderful hospitality of the two Brussels community and to the attendees from sixteen countries, many of whom had travelled to an EUPJ event for the second time this year following the Biennial in Prague at the end of April. To wrap up briefly, this shabbaton in Brussels was a unique experience, a great time to gather and to pray together. It reinforced the ties among our synagogues and strengthened our motivations to continue to build up the Progressive Jewish movement in Europe. Gilbert Lederman served as a Co-Organizer of the ‘Shabbaton in Brussels’ and is currently Vice-president of Beth Hillel in Brussels and an Executive Board Member of the EUPJ and World Union. Please fill out this form to share "[BRUSSELS] Shabbaton of the European Union for Progressive Judaism (EUPJ) Celebrates the Growth Our Movement Across the Region" via e-mail.